Most people know the saying, “there is no place like home” , but does that also apply when it comes to your wedding.Whether it’s the home you two share, a childhood home for one of you , or the families sprawling vacation property having an at-home wedding has become an option for many couples. The only bigger question once you choose to do this is how can you do it right? First things first, an at-home wedding is a rather small and intimate affair, that means that you cannot invite everyone you would like to, so if you cannot commit to having a small guest list then finding a ceremony venue would probably be best.You should make sure that even if your guest list is manageable for the events that may take place in the properties backyard, that the same amount of people can fit inside in case of rain. Once this portion of your planning has been discussed and you have settled upon a number of guests you can move on to the next portion of your planning so you can decide on what portions of the house or property the ceremony will take place in. Having an indoor ceremony is not always the easiest of tasks. 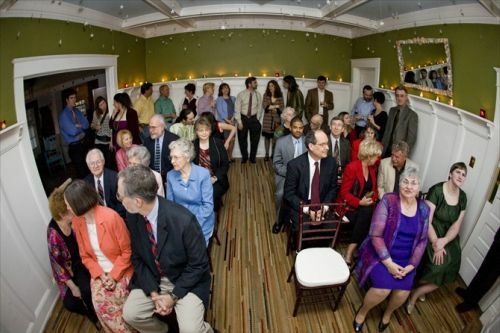 This will require you to clear out one of the biggest “common” rooms in your home in order for our guest to be comfortable while witnessing your ceremony. This will also require you to crank up the air conditioning a few hours before the ceremony so that it isn’t uncomfortably warm when all of your guests cram into one space. You can add a nice touch by using plenty of candle light to add an intimate glow to the room.If your not too into the addition of actual warmth with the candles then you can use your white christmas lights to add the same warm glow. 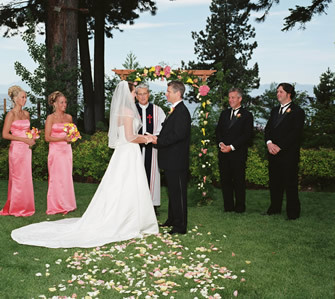 A wedding ceremony in your backyard can also lend itself to intimacy on your big day. With the limited amount of guests , you will not need to use microphones in order for all of your guests to hear you exchange vows. You will also be able to make a seamless transition into your cocktail hour and reception depending on the amount of space and the way you have positioned these activities on the property. An indoor reception is best for those cooler months out of the year. Just like the indoor ceremony it lends itself to a much closer feel for you and your guests. Also, you will be able to use your dining room in the same manner that you used your ceremony space, intimate candle light or false candle light can add the perfect glow while you and your guests share dinner. You will also be able to make a few CD’s that will play while you and your guests are enjoying the rest of the evening , that eliminates the need for a DJ or band. 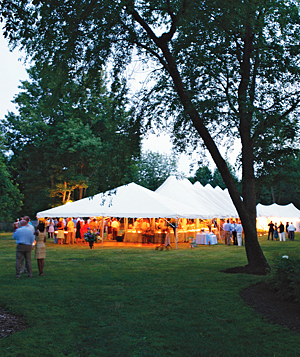 An outdoor reception can give you and your guests more space to relax, mingle, and of course dance. Depending on the weather at the time of your reception and the amount of people you may need to rent a tent with a sturdy floor for dancing. With a bigger outdoor venue a simple CD player may not suffice so you will need to look into ways to either amplify your music selections or getting a DJ or band.Your outdoor venue also allows children the opportunity to run and play without the well-known restrictions of “running in the house”. Though many couples love the idea of an at-home wedding and reception it does not always make it the cheapest option. There are still more expenses that you will need to consider once you choose to wed at home. 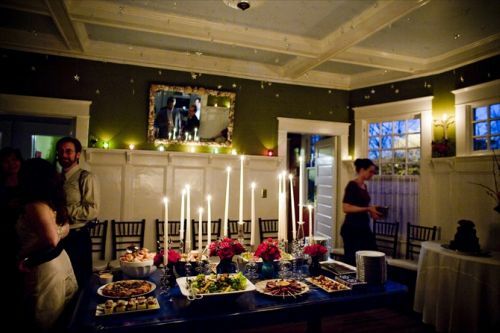 You will most definitely need to rent tables, chairs, table settings , linens and much more. You will most likely need a tent for an outdoor event and not to mention a caterer as well as a private space for the caterer to prepare your plated dinners or your buffet. You will also need to invest time in getting the proper permits for your event, whether it’s for all the parking your guests will take up in the residential neighborhood or the loud music from your reception late into the night. No matter what you choose to do, remember that your wedding day will be as beautiful as you two make it. ENJOY!!! This entry was posted in Budget & Finance, Uncategorized, Wedding Advice & Tips, Wedding Details, Wedding Planning, Wedding Style and tagged bridal, budget & finance, Layne Corban, marriage, wedding, Wedding Day, Wedding Details, Wedding Locations & Venues, Wedding Planning, Weddings. Bookmark the permalink.